My easy peach cobbler recipe from scratch is wonderful. Simple to prepare and the smell in the house is fantastic. Many homemade fruit dessert recipes and more to call your own. In a hurry? This easy peach cobbler recipes uses canned peaches. Combine the peaches, sugars and spices - spread over the batter. DO NOT STIR. Bake for 35-45 minutes or until the batter comes to the top, and is golden brown. Serve warm with my homemade vanilla ice cream or homemade whipped cream. 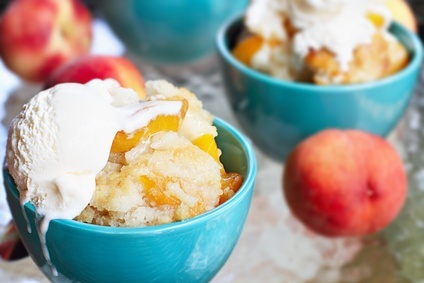 This easy peach cobbler recipe is divine. If you don't have fresh peaches, canned peaches are okay.